MRtrix3 provides a flexible data input/output back-end in the shared library, which is used across all applications. This means that all applications in MRtrix3 can read or write images in all the supported formats - there is no need to explicitly convert the data to a given format prior to processing. However, some specialised applications may expect additional information to be present in the input image. The MRtrix .mif/.mih formats are both capable of storing such additional information data in their header, and will hence always be supported for such applications. Most image formats however cannot carry additional information in their header (or at least, not easily) - this is in fact one of the main motivations for the development of the MRtrix image formats. In such cases, it would be necessary to use MRtrix format images. Alternatively, it may be necessary to provide the additional information using command-line arguments (this is the case particularly for the DW gradient table, when providing DWI data in NIfTI format for instance). Image file formats are recognised by their file extension. One exception to this is DICOM: if the filename corresponds to a folder, it is assumed to contain DICOM data, and the entire folder will be scanned recursively for DICOM images. It is also important to note that the name given as an argument will not necessarily correspond to an actual file name on disk: in many cases, images may be split over several files. What matters is that the text string provided as the image specifier is sufficient to unambiguously identify the full image. All coordinates or vector components supplied to MRtrix3 applications should be provided with reference to this coordinate system. will collate all images that match the pattern MRI-volume-<number>.nii.gz, sort them in ascending numerical order, and access them as a single dataset with dimensionality one larger than that contained in the images. In other words, assuming there are 10 MRI-volume-0.nii.gz to MRI-volume-9.nii.gz, and each volume is a 3D image, the result will be a 4D dataset with 10 volumes. will collate all images that match the data-number-number.nii pattern and generate a single dataset with dimensionality two larger than its constituents. Not all image formats support all possible datatypes. The MRtrix image file formats are designed to handle all of the possibilities listed below, while other image formats may only support a subset. When a data type is requested that isn’t supported by the image format, a hopefully suitable alternative data type will be used instead. Below is a list of the supported data types and their specifiers for use on the command-line. Note that MRtrix is not sensitive to the case of the specifier: uint16le will work just as well as UInt16LE. Voxel size:        2.30769 x 2.30769 x 2.3 x ? The ‘Transform’ field above shows the first 3 rows of the transformation matrix (technically, this is a 4×4 matrix, but the last row is always set to [ 0 0 0 1 ]). The first 3 columns correspond to the x, y & z image axes respectively, while the last column corresponds to the location in real (scanner/world) space of the corner voxel (i.e. the voxel at index [ 0 0 0 ]). In MRtrix3, the transform shown always corresponds to the transformation from image coordinates in millimeters to scanner coordinates in millimeters - the voxel size is not taken into account, and the image axes are always normalised to unit amplitude. This may differ from other packages. Furthermore, MRtrix3 will always present the transform that best matches the real space. If the transform of the image on file represents a large rotation, such that for example the first image axis is closer to the scanner’s z axis, this transform will be modified by permutation or inversion of the axes to bring it in alignment with the expected coordinate system, so that the first axis genuinely can be interpreted as approximately left-right, etc. To achieve this, MRtrix3 will also modify the image Strides to match. A file is simply a linear array of values. Image data on the other hand are multidimensional arrays. The image values can therefore be ordered on file in many different ways. For example, we could start from the voxel at the left posterior inferior corner of the image, and store intensity values in order of traversal towards the right. Once the other end of the image is reached, we repeat the process for the row of values anterior to the last one, and repeat until the end of the slice. At this point, we store the slice superior to the last one, until the whole image has been stored. This ordering scheme is what is typically used in the NIfTI standard, and is commonly referred to as RAS (right anterior posterior), referring to the direction of traversal of each axis in turn. This scheme is also often referred to as neurological, although this term is in general much more ambiguous. However, this is only a convention, and many other combinations are possible. For instance, it is possible to start from the right posterior inferior corner, and raster through along the left direction, then store the next row along the anterior direction, and finally the next slice in the superior direction. This scheme is what is normally used in the now deprecated Analyse format, and is commonly referred to as LAS or radiological. Of course, there are many more possibilities. For instance, sagittal DICOM images will typically be stored using a PIR (posterior inferior right) order, since each sagittal slice is stored in order, etc. MRtrix3 applications are agnostic to the order of storage, and can handle any such images provided the format is clear about what the order is. In MRtrix3, the order of storage is defined by their strides. These refer to the number of voxels between a given voxel and the next voxel along a given dimension. For instance, in a 128×128×128 image stored using RAS ordering, the strides would be 1,128,16384: the next voxel along the x axis is just one voxel away, while the next voxel along the y axis is 128 values away (i.e. a whole row of x values), and so on. In contrast, if stored in LAS order, the strides would be -1,128,16384, indicating that the next voxel along the x axis would actually be stored one value before the current one. To simplify the specification of these strides, MRtrix3 typically expects and provides symbolic strides. For example, the RAS strides above would be expressed as 1,2,3, since this is sufficient to deduce the actual strides once the image dimensions are known. Likewise, LAS would correspond to strides of -1,2,3, PIR to 3,-1,-2, etc. This has the advantage that the specification of the strides is then independent of the image dimensions. Using strides to specify ordering also allows the specification to generalise to arbitrary dimensions. For example, it is fairly common for MRtrix3 applications to request their output for 4D images to be written with strides 2,3,4,1 (if the image format supports it): this corresponds to a volume-contiguous order, whereby the values for all volumes of a given voxel are written next to each other on file; this often has performance advantages for applications that need to process all values for a given voxel concurrently (as is often the case in diffusion MRI), by allowing the hardware to make better use of resources (tractography is one such example). Likewise, if you need to ensure the orientation is neurological (RAS), you can specify strides 1,2,3,4 (or use the 1:4 shorthand). You can also specify other combinations if required: for example -strides -2,-1,3,4 would correspond to a PLS coordinate system, -strides 2,3,4,1 would correspond to volume-contiguous storage (with RAS for the spatial axes), etc. The different formats supported by MRtrix3 differ in the range of strides that they support. The MRtrix image formats (.mih / .mif) are the only formats to support arbitrary combinations. Not all image formats support all possible datatypes. The MRtrix image formats (.mih / .mif) are designed to handle arbitrary strides, while other image formats may only support a limited subset. When strides are requested that are not supported by the image format, a hopefully suitable alternative will be used instead. There is an interaction between the strides and the image transform: if the transform matrix corresponds to a 90° rotation, this can be viewed as changing the strides without affecting the transform. Such a large rotation has changed the order of storage relative to the anatomical labels typically used to refer to the ordering (e.g. RAS, LAS, etc). For example, if a RAS image is modified such that its transform rotates the image axes by 90° around the y axis, this in effect implies that voxels are now ordered IAR (i.e. right becomes inferior, anterior remains as-is, and superior becomes right). The MRtrix3 back-end will indeed interpret such large rotations as affecting the strides, so that if the strides are stated as 1,2,3, the order of storage will always be left->right, posterior->anterior, inferior->superior relative to the scanner axes. Note that this also implies that the transform matrix will always be modified as necessary to bring it close to the standard coordinate system, so that the first image axis is close to the x axis, etc. This allows MRtrix3 applications to operate on images in the knowledge that these axes are always anatomically as expected, without worrying about the details of how this information was actually stored on file. It is important to bear this in mind when interpreting for output of mrinfo for example, since this produces the strides and transform as interpreted by MRtrix3, rather than those actually stored on file - although the two representations should be strictly equivalent. If you need to inspect the information as stored on file, use mrinfo’s -norealign option. This lists the various image formats currently supported by MRtrix3. simplicity: as detailed below, the header format is deliberately kept very simple and human-readable, making it easy to debug and edit manually if needed. extendability: any information can be stored in the header, and will simply be ignored by the application if not recognised. arbitrary data organisation: voxel values can be stored in any order, making it simple to ensure for example that all FOD coefficients for a given voxel are stored contiguously on file. Note that MRtrix3 now includes MatLab functions to read and write MRtrix image files, and to load MRtrix tracks files. These are located in the matlab subfolder. MRtrix3 also supports the compressed version of the single-file .mif format, both for reading and writing. While this can reduce file sizes, it does incur a runtime cost when reading or writing the image (a process that can often take longer than the operation to be performed), and will require the entire image to be loaded uncompressed into RAM (MRtrix3 can otherwise make use of memory-mapping to keep RAM requirements to a minimum). For large files, these costs can become considerable; you may find that MRtrix3 can process a large uncompressed image, yet run out of RAM when presented with the equivalent compressed version (in such cases, you can try using gunzip to uncompress the file manually before invoking the relevant MRtrix3 command). The header is the first (and possibly only) data stored in the file, as ASCII-encoded text (although other encodings such as UTF8 may work equally well). Lines should be separated by Unix-style newlines (line-feed, ‘’, ASCII 0x0A), although MRtrix will also accept DOS-type newlines. The first line should read only mrtrix image to indicate that this is an image in MRtrix format. The last line of the header should read only END to signal the end of the header, after which all data will be considered as binary. All lines between these two entries must be represented as key-value pairs, as described below. All following lines are in the format key: value, with the value entry extending up to the end of the line. All whitespace characters before and after the value entry are ignored. Some keys are required to read the images, others are optional (sensible defaults will be substituted if they are absent). Recognised keys are provided in the list below, along with the expected format of the corresponding values. the image dimensions, supplied as a comma-separated list of integers. The number of entries specifies the dimensionality of the image. For example: dim: 192,256,256 specifies a 192×256×256 image. the voxel size along each dimension, as a comma-separated list of floating-point values. The number of entries should match that given in the dim entry. For example: vox: 0.9,0.898438,0.898438.
specifies the organisation of the data on file. In simplest terms, it provides a way of specifying the strides required to navigate the data file, in combination with the dim entry. It is given as a comma-separated list of signed integers, with the sign providing the direction of data traversal with respect to voxel coordinates, and the value providing a way of specifying the order of increasing stride. For example, assuming an image with dim: 192,256,256, the entry layout: +2,-0,-1 is interpreted as: the shortest stride is along the y-axis (second entry), then the z-axis (third entry), and then along the x-axis. Voxels are stored in the order left to right (positive stride) along the x-axis; anterior to posterior along the y-axis (negative stride); and superior to inferior (negative stride) along the z-axis. Given the image dimensions, the final strides are therefore 256×256=65536 for adjacent voxels along the x-axis, -1 for the y-axis, and -256 for the z-axis. This also implies that the voxel at coordinate [ 0 0 0 ] is located 65536 voxel values into the data portion of the file. specifies where the binary image data are stored, in the format file: filename offset, with the offset provided in bytes from the beginning of the file. For example: file: image.dat 0. For the single-file format (.mif), the filename should consists of a single full-stop (‘.’) to indicate the current file, and the offset should correspond to a point in the file after the END statement of the header. For the separate header/data format (.mih), the filename should refer to an existing file in the same folder as the header (.mih) file. Multiple such entries can be supplied if the data are stored across several files. used to specify how intensity values should be scaled, provided as an offset and scale. Voxel values will be read as value_returned = offset + scale * value_read. For example: scaling: -1,2. Default is 0,1 (no modification). In addition to these keys, it is also possible to store additional key-value pairs within the header of these image files. If a particular key is not recognised by MRtrix3, it is simply ignored (but may be carried over to any outputs resulting from the command, depending on the particular command). There are some keys that are utilized by particular MRtrix3 commands in order to preserve important information as image data are passed between commands. A prominent example is dw_scheme, which is used to embed the diffusion gradient table within the Image header. The “.” period character as the numerical decimal separator. The “,” comma character as the delimiter between entries. Creation or manipulation of header data such that it does not conform to these requirements may lead to unpredictable software behaviour. DICOM format is only supported for reading. MRtrix3 applications will assume an image is in DICOM format if the image specifier provided corresponds to a folder or ends with the .dcm extension. For a folder, the application will scan the entire folder and its subfolders for DICOM files and generate a list of DICOM patients, studies and series. If a single series is found within the folder, this data set will be accessed with no further interaction required. Otherwise, the user will be prompted to select the series of interest. MRtrix3 supports data from all major manufacturers, including Siemens mosaics and the newer single-file multi-frame format. A separate application, dcminfo, is provided to view all DICOM header elements within a particular DICOM file, including Siemens’ custom shadow attributes (CSA). Note that no support is provided for reading the DICOMDIR entry due to case-sensitivity issues. DICOM data are typically stored on CD or DVD on a case-insensitive filesystem. However, Unix systems will typically not access these filesystems in a case-insensitive manner, and will fail to find the appropriate files if the case of filenames supplied in the DICOMDIR file does not match the case of the files found on the CD or DVD. These file formats are supported both for reading and writing, and allows interoperation with other packages such as SPM or FSL. The mrinfo command can be used to determine whether a particular image is in NIfTI-1 or NIfTI-2 format. Use of the NIfTI format can introduce ambiguity into the transformation information used to orient and localise the image data with respect to physical space, particularly when combined with the use of multiple software packages. More information is provided in the “:ref:nifti_qform_sform” section. MRtrix3 also supports compressed NIfTI images (both versions 1 & 2), for both reading and writing. MRtrix3 supports both of these formats for reading and writing. Images stored in these formats may include additional data structures that follow the image data. These data structures provide a similar functionality to the Header key-value pairs used in the MRtrix image formats (.mih / .mif). Whenever _MRtrix3_ writes an image to one of these formats, it will check the Header key-value pairs for any such data that may have been created by _MRtrix3_ when importing such an image earlier. Any such data found will be correspondingly written to the data structures following the image data, formatted such that FreeSurfer tools are capable of reading them. Other header key-value entries that do not begin with “MGH_*”, and of which FreeSurfer is not aware, will _not_ be written to this section of any output .mgh / .mgz image files. This file format is supported both for reading and writing. However, when writing, the newer NIfTI standard will be used, since the Analyse format cannot store crucial information such as the image transform, and is hence deprecated. If these images are actually stored as NIfTI, they will be handled appropriately according to the standard. In order to specify an Analyse format image on the command line, type the name of its data file (*.img), not the header file. By default, Analyse format images will be assumed to be stored using RAS (radiological) convention. This can modified in the Configuration file, by setting the Analyse.LeftToRight entry to true. Images for representing discrete multi-fibre models are sparse in nature (i.e. different voxels may have different numbers of fibre populations - a.k.a “fixels”, as described in the “Fixels” (and “Dixels”) page), and different models have different parameter requirements per fixel (e.g. orientation, volume fraction, fanning, tensors etc). This fixel image format overcomes several issues in storing such data in either traditional 4D images or a custom format (such as the legacy Legacy MRtrix Sparse Format (.msh / .msf)). Space saving. Because different voxels may have different numbers of fixels, it is inefficient to store data using 4-dimensional images, since the size of the 4th dimension must accommodate the voxel with the highest number of fixels. A sparse representation on disk is therefore more efficient. 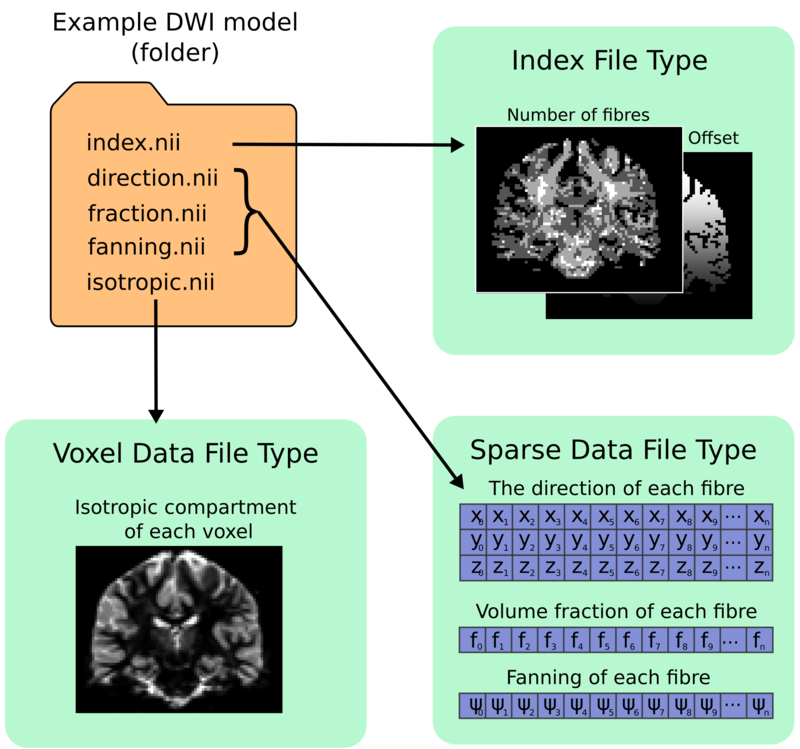 Easily read and written by other software packages to enable inter-operability of fixel-based DWI models. Flexible enough to allow for both fixel-specific model parameters (e.g. volume fractions, fanning), and voxel-specific parameters (e.g. hindered isotropic compartment). The format should also support any number of model parameters. Self-documenting. Users should be able to easily infer what kind of data is included in the model. Developers should also easily understand the data layout, without having to read in special fields in the image header. Minimise the need for supporting commands. We wanted to avoid the need to have dedicated commands for performing basic operations on the data (e.g. math/calculator operations, thresholding, histogram generation etc). Extendability. Users should be able to add components to an existing sparse image. E.g. a mask to label fixels of interest, or additional test-statistic output from a group analysis. In the fixel format we have opted to leverage the file system by storing data belonging to a single sparse DWI model inside a single directory/folder (in contrast to the old Legacy MRtrix Sparse Format (.msh / .msf) where all data is stored inside a single file). Effectively the directory becomes the ‘dataset’. While this implies that all data files must be kept together inside the directory, and can be tampered with (or accidently deleted) by users, we believe the transparency and accessibility of the data is beneficial and enables all of the above requirements to be met. 4D image (i x j x k x 2). The index file is required, with fixed naming (index.nii or index.mif). The first 3D volume in the 4th dimension stores the number of elements (fixels) per voxel. The second volume in the 4th dimension stores the index of the first element (fixel) in that voxel; indices for the subsequent elements in each voxel are inferred to be sequential. 3D image (n x p x 1) where n is the total number of elements in the image, and p is the number of parameters per element (e.g. 3 for direction.nii, 1 for volume.nii, or 6 for a multi-tensor model). For each voxel, data for the elements within that voxel must be stored within sequential indices in the first dimension. Any number of Fixel Data File types may be present in the directory. In the example image above, the volume fraction and fanning angle parameters have been saved as separate files; however the format is flexible and allows for multiple parameters, p, per element. Any naming convention can be used for Fixel Data Files, with the exception of: - The directions file (see below). - If a particular set of commands expect to write and subsequently read one or more data files with a fixed name, then manually renaming such files may prevent the operation of that set of commands. The number of fixels in a whole-brain image can be very large (> 100,000). The NIfTI-1 format therefore cannot be used in this context, as it restricts the total number of voxels along any dimension of the image to 65,535. This is why either NIfTI-2 or MRtrix image formats (.mih / .mif) must be used. All fixel-based DWI models must specify the direction of each fixel. Directions for each fixel must be saved within a single file named either directions.nii or directions.mif. This can be considered as a special type of fixel data file, with dimensions (n x 3 x 1). Directions must be specified with respect to the scanner coordinate frame, in cartesian coordinates. In this example, a new fixel format directory is created, with the name patient01_fixel_directory; this includes creation of the requisite index and directions files. Fixel Data Files for two fixel-specific measures (AFD and dispersion) are then additionaly saved inside this directory. Fixel data can be visualised using the “Fixel Plot” tool in mrview. Any image within the fixel directory can be opened by the file chooser. By default the fixels will be coloured based on the file selected when loaded (e.g. if you select the fixel directions file, fixels will be colour-coded by direction; if afd.mif is selected they will be coloured by AFD value). Irrespective of the file selected to view the fixel file, all other fixel file types in the fixel directory will be detected and available for use in colour-coding and thresholding fixels via a combo box in the Fixel Plot tool. This enables advanced visualisations such as thresholding fixels by p-value while colour-coding by effect size. This is an old legacy format prevously used for applications where the number of discrete elements within a voxel may vary between voxels (typically used to store fixels). This format has been superseded by the new directory-based Fixel image (directory) format. While all fixel-related commands now only use the new format, files stored in the legacy format can still be viewed in mrview. Much like the standard MRtrix image formats (.mih / .mif), there are two different image file extensions available. One (.msh) separates the image header information and raw data into separate files, while the other (.msf) encodes all information relevant to the image into a single file. However unlike these established formats, sparse images contain two separate raw data fields. The first of these behaves identically to standard images: a single intensity value for every image element. The second stores sparse image data. For any particular image element, the intensity value within the standard image field defines a pointer to a location within the sparse image field, where the sparse data relevant for that image element can be found. The ‘magic number’ that appears at the start of the file must read ‘mrtrix sparse image’. Key:value pair ‘sparse_data_name’ defines the name of the class used in the sparse data field. This class name is typically not reader-friendly; the value that appears is that provided by the C++ call typeid(XYZ).name() for a class called XYZ. This is necessary to ensure that the data stored in the sparse field can be interpreted correctly. Key:value pair ‘sparse_data_size’ defines the size (in bytes) of the class used to store the sparse data. The ‘datatype’ field MUST be a 64-bit integer, with the same endianness as the system. A 64-bit integer type is required because the standard image data provides pointers to the sparse data in memory, while the endianness is tested to ensure that the sparse data can be interpreted correctly. Note that sparse images cannot be transferred and used between systems with different endianness. In addition to the ‘file’ key, a second key ‘sparse_file’ is also required, which provides the path to the beginning of the sparse image data. In the .msf format, this provides an offset from the start of the file to the start of the sparse data field; in the .msh format, a second associated data file with the extension .sdat is generated on image creation, and the path to this file is defined in the header. Within the sparse data field, there is no delimiting information or identifying features; the image format relies on the integers stored in the standard image field to provide offset pointers to appropriate locations within the sparse field. From the data position defined by such an offset, the first 4 bytes provide a 32-bit integer (with native endianness), which specifies the number of discrete elements stored. This is followed by data to fill precisely that number of instances of the sparse data class. Note that no endianness conversion can be performed on this data; data is read and written using a straight memory copy. The format for track files is similar to that for MRtrix image formats (.mih / .mif). It consists of a text header in the same key: value format, ending with a single ‘END’ statement, and followed by binary data. a file: . offset entry is required to specify the byte offset from the beginning of the file to the start of the binary track data. At this stage, only the single-file format is supported - in other words the filename part must be specified as ‘.’ (see above for details). specifies the datatype (and byte order). At this point only the Float32 data type is supported, either as little-endian (LE) or big-endian (BE). The binary track data themselves are stored as triplets of floating-point values (at this stage in 32 bit floating-point format), one per vertex along the track. Tracks are separated using a triplet of NaN values. Finally, a triplet of Inf values is used to indicate the end of the file.